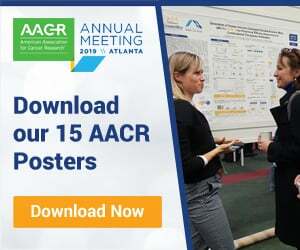 Recap all our AACR presentations on murine models including bioluminescent orthotopic syngeneic models, syngeneic model research into immune cell lineage impact on anti-PD-1 response, and prostate cancer tumor homograft models. Our first syngeneic poster looks at the development and utilization of bioluminescent, orthotopic syngeneic models. Orthotopic models have a tumor environment (TME) more comparable to patient disease. This is down to the the organ-specific location of the tumor, which facilitates metastasis. and also recapitulates the immune and stromal component interactions with the tumor. As response to immunotherapy is heavily dependent on the tumor microenvironment, orthotopic models allow a more clinically relevant approach to I/O drug development. Using bioluminescent models allows the non-invasive longitudinal monitoring of orthotopic tumor burden and end stage quantification of tumor spread. The poster takes a look at our strategy for generating bioluminescent cell models, before moving on to Hepa 1-6-luc model development. The orthotopic Hepa 1-6 tumor model recapitulates the hepatocellular carcinoma tumor microenvironment, with T cell infiltration at the tumor-liver interface detected by CD4 and CD8 staining. Treating the Hepa 1-6-luc orthotopic model with standard of care agent sorafenib or anti-PD-1 inhibits tumor development, with tumor growth monitored through bioluminescent imaging and treatment response quantitated against vehicle control. Tumor infiltrating lymphocytes are assessed by FACS analysis or IHC in these models. We also present treatment data for the GL261-luc brain orthotopic tumor model with anti-PD-1 antibody, which mimics the TME within the blood brain barrier. Our panel of bioluminescent syngeneic cell lines covers a range of cancer subtypes including liver cancer, breast cancer, and glioma, and allows both orthotopic and metastatic modeling. These models allow the assessment of standard of care agents, immunotherapies, and combination regimens in a more clinically relevant environment. 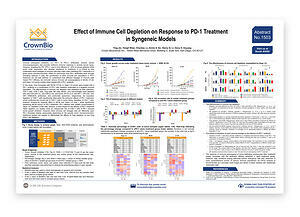 Our next poster uses syngeneic models to help evaluate how different immune cell lineages impact anti-PD-1 efficacy. 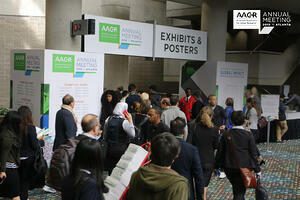 Anti-PD-1/PD-L1 agents only work in around 20% of cancer patients. To help understand why response rate is low, and why some responders develop resistance, it’s important to understand which immune cell lineages (other than cytotoxic T cells) help mediate PD-1 response in any given tumor microenvironment. To study this, various immune cell subpopulations were depleted in MC38, CT-26, and Hepa 1-6 murine tumor models alongside their treatment with an anti-PD-1 antibody. 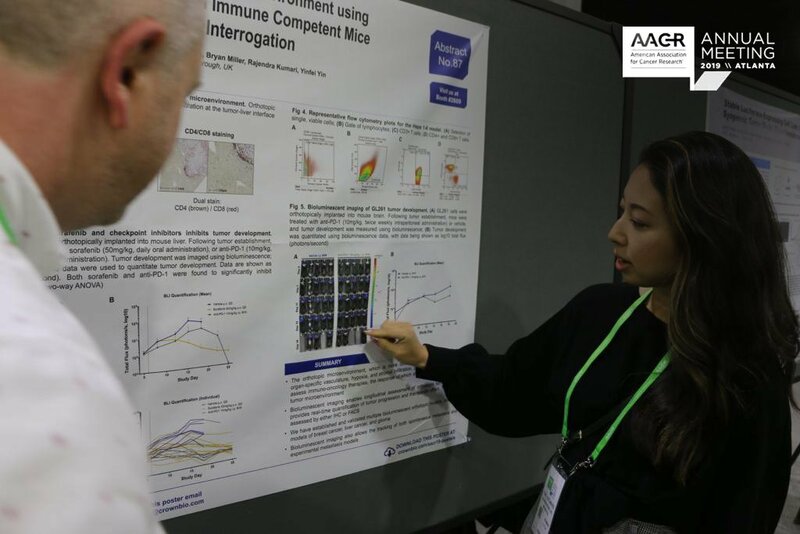 Flow cytometry was used to assess the effectiveness of immune cell depletion, and CD4 T cells, CD8 T cells, Treg cells, NK cells, MDSC, and macrophages were depleted via a variety of antibodies and clodronate liposomes. The effects of depleting different immune cell lineages varied across models, with some very interesting results. As expected, CD8+ T cell depletion significantly attenuated PD-1 antitumor effects across all three models. This confirms the crucial role of cytotoxic T cells in the mechanism of action of checkpoint inhibitors. Interestingly, the depletion of CD4+ T cells showed opposite effects for the MC38 and Hepa 1-6 models. This depletion significantly sensitized MC38 tumors to anti-PD-1 treatment, but for Hepa 1-6 anti-PD-1 efficacy was notably reduced. It’s possible that this is due to variable effects of CD4+ T cell subpopulations in different models after anti-PD-1 treatment. Depletion of NK cells showed only a minor impact on the efficacy of anti-PD-1 treatment. We also performed immunophenotyping on tumor-infiltrating lymphocytes after treatment, which largely correlated with the antitumor efficacy achieved in each treatment group. Overall, our study confirms an unequivocal role of CD8+ T cells in anti-PD-1 induced tumor growth inhibition. However, other immune cell lineages seem to act differently upon PD-1 blockade release, presumably depending on the specific tumor microenvironment. 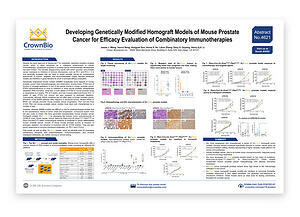 Our final murine model poster moves away from traditional syngeneic models to look at unique tumor homograft models. These are subcutaneous or orthotopic homografts from spontaneous, carcinogen-induced, or CRISPR/Cas9-engineered GEMM tumors in immunocompetent syngeneic hosts. 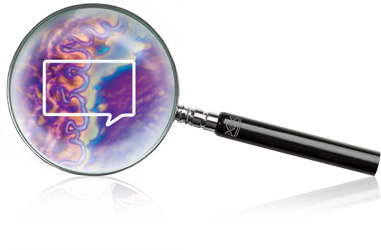 Tumor homografts combine the benefits of GEMM with improved operational simplicity, consistency, and growth, for in vivo efficacy studies. 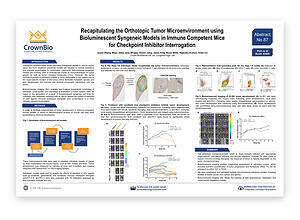 Poster 4621 looks at the development of a panel of prostate cancer tumor homografts. These provide models allowing the testing of combination targeted agents and immunotherapies, which is likely to be the future of prostate cancer treatment. Our tumor homograft models are developed by transplanting primary mouse tumors subcutaneously to syngeneic recipients, and feature Pbsn-Cre;LSL-KrasG12D/+;Ptenflox/flox or Pbsn-Cre;Ptenflox/flox. We’ve confirmed that the models are morphologically similar to moderate-to-poorly differentiated human prostate cancer. In summary, our prostate cancer tumor homograft models provide a novel platform for immunotherapy and combination regimen drug development, providing clinically relevant features and immunocompetence in an easy to use model. 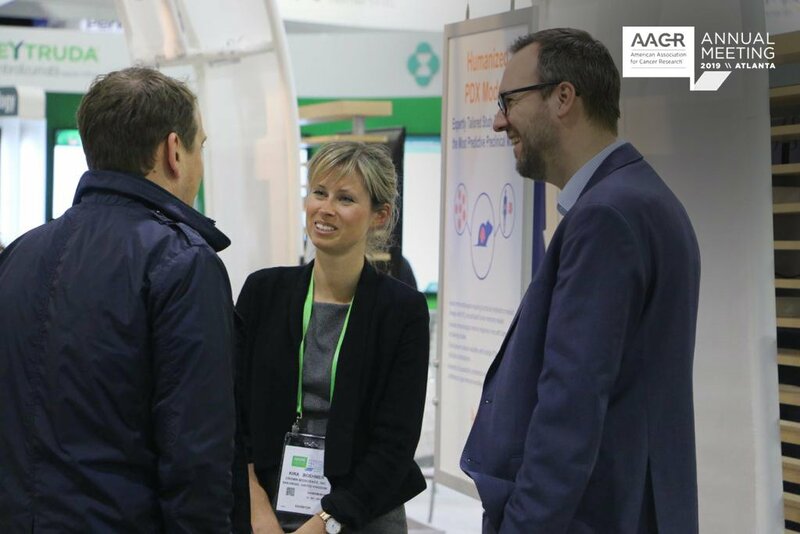 Read more about our the new preclinical developments we’re presenting at AACR, with posts on humanized and PDX models, along with novel technologies and assays.